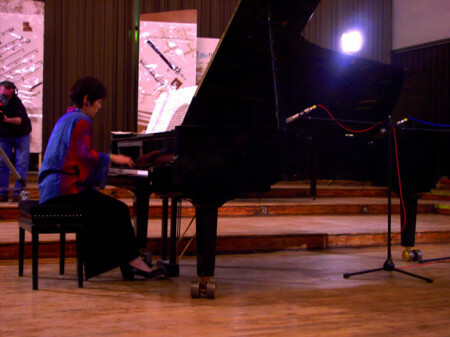 Virtuoso pianist Aki Takahashi is recognized internationally as one of the world’s foremost interpreters of contemporary music. Her enthusiasm for modern music has led her to have close working relationships with many important composers of our time, including John Cage, Morton Feldman, Toru Takemitsu, Richard Teitelbaum, Peter Garland, and others. She is also known for her performances of music by Erik Satie, Olivier Messiaen, Pierre Boulez, Luciano Berio and Iannis Xenakis. The Banshee by Henry Cowell (1897-1965) is an experiment in musical sonority. The piece is performed entirely on the strings of the piano with the pedal depressed. Born in California, Cowell began his formal training at the Univesity of California Berkeley with Charles Seeger. One of the most inventive composers of his day, Cowell developed a number of formal and technical innovations, such as playing inside the piano, and playing “clusters” of notes with the forearm. One of his formal innovations was a concept, described in a series of articles in 1934, where the performers would choose the order of various segments of music provided by the composer, which would result in his idea of “elastic form.” Cowell was also an important teacher, theorist, publisher and concert organizer, and had an enormous influence on the next generation of American composers, including Cage and Lou Harrison. Charles Griffes (1884-1920) grew up in Elmira, New York and travelled to Berlin to study composition and piano in 1904-1907. In Berlin he was strongly influenced by German Romanticism and the music of Debussy. An accomplished pianist, his published string quartet (based on American Indian themes), two stage works and several orchestral works are transform-ations of compositions first written on the piano. Born in Ohio, Ruth Crawford (1901-1953) moved to New York in 1929 to study with Charles Seeger and went to Berlin in 1930 on a Guggenheim Fellowship. Her preoccupation with counter-point in the Preludes shows on the one hand an exceptional purity and precision in the consistency of line against line and phrase over phrase; on the other hand, this focus on contrapuntal melodic movement is rendered at the expense of a lesser focus on color for the sake of color. Unlike the music of her contemporary Stefan Wolpe, who lived for a time in New York and also was preoccuppied with contrapuntal form, the rhythm of Crawford’s music does not drive; instead there is a well-tempered and exquisitely understated flow. Cage’s student, Morton Feldman (1926-1987) was born in New York of Russian immigrant parents and met Cage in 1949. Both Cage and Feldman maintained close association with the emerging abstact expressionist painters in New York in the late 40s and early 50s. In his lectures to students, Feldman gave special attention to what he called “the vertical” in music: as one example, the registration of chords and their placement in time so that it is as though there is a sense of space between the sounds. Particularly in later works there is the intimation of a “canvas” for musical time. In Piano Piece (To Philip Guston) it is as though each of the chords has a particular weight of its own and a brush-like quality that allows each to be heard as an object in itself. Feldman’s preoccupation with sonority, color and other visual aspects in music led to the exploration of graph notation in the early years and later to longer durations for his string quartets and chamber pieces.